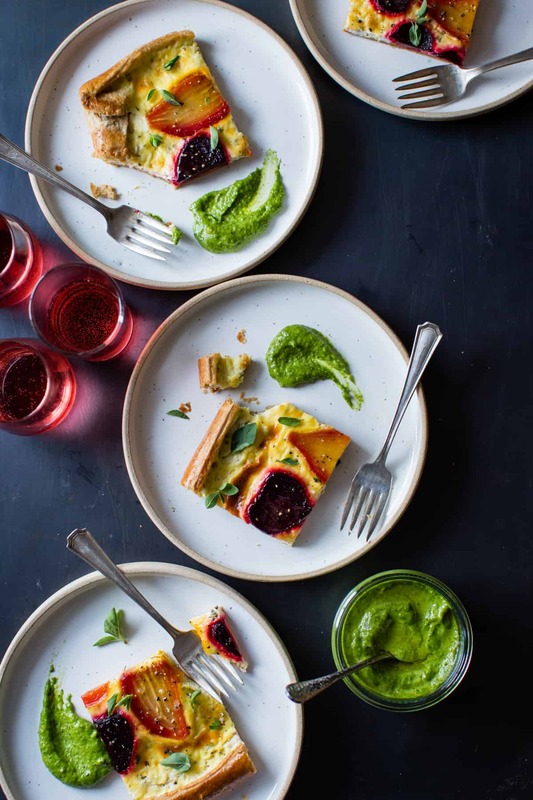 This savory, rustic tart makes use of the whole beet – from leaf to root – all tucked into flaky gluten-free pastry with ricotta goat cheese custard and slathered in brilliant green pesto. A collaboration with Imperfect Produce. Are you a beet lover or hater? I’m a lover, most of the time. With their intense color and earthy-sweet flavor, beets can be a polarizing ingredient. I never thought much about beets until I met Jay, who simmers the little roots, then slices them into green salads tossed with shallot vinaigrette and crumbles of feta. Beets pair beautifully with cheese, whose creamy salinity helps to temper the roots. 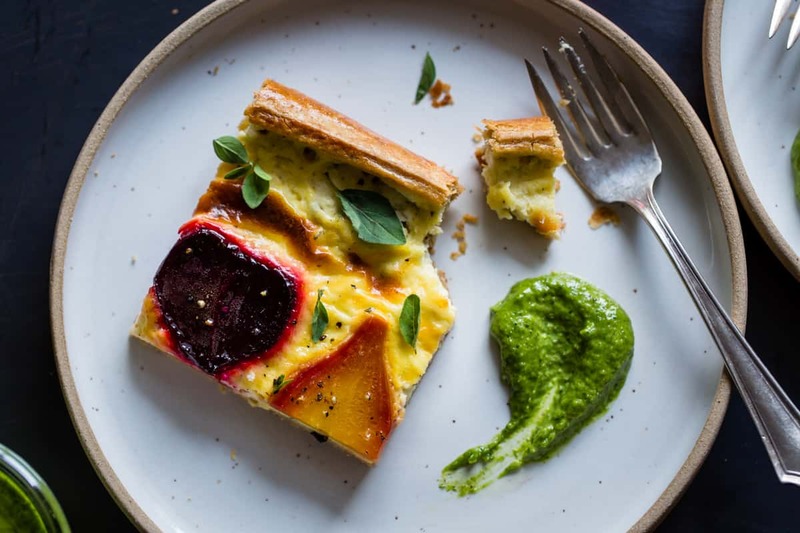 So when my friend Aleks delivered a giant box of Imperfect Produce to me the other day, including three varieties of beets, I set to work to feature them in this savory tart. You’ve likely seen Imperfect in the news lately. Their concept is so elegant, it amazes me that no one’s done it yet: Imperfect collects produce from local farms that is deemed “flawed” and would normally go straight to the compost pile – artichokes that are a tad too small, crooked carrots, nicked zucchini, pithy citrus, malformed apples – and resells them in CSA boxes at a low cost – about 50% of normal retail. If you’ve ever tried to grow produce yourself, you know how much time, energy, and resources go into the process. I would personally be thrilled if my brown thumb could produce even one carrot, crooked or no. 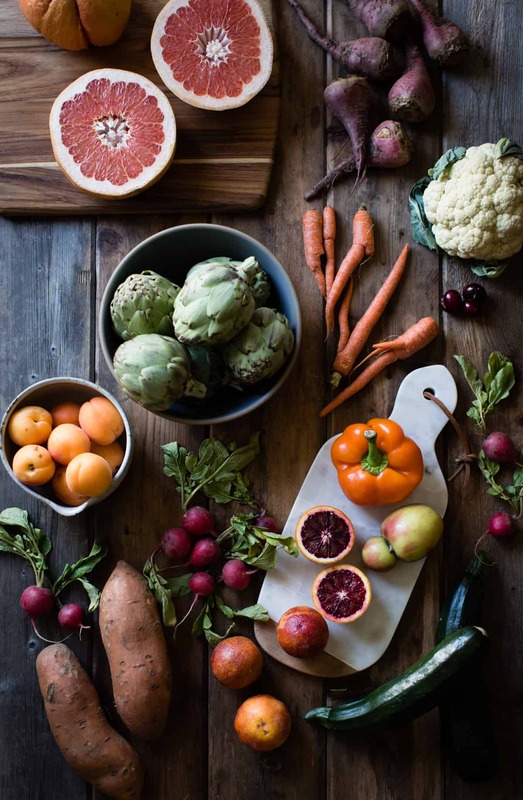 So knowing that 1 in 5 perfectly delicious fruits and vegetables goes to waste makes me sad, especially given the large numbers of hungry people in the world, families who lack access to fresh produce, and scarcity of water and other resources. 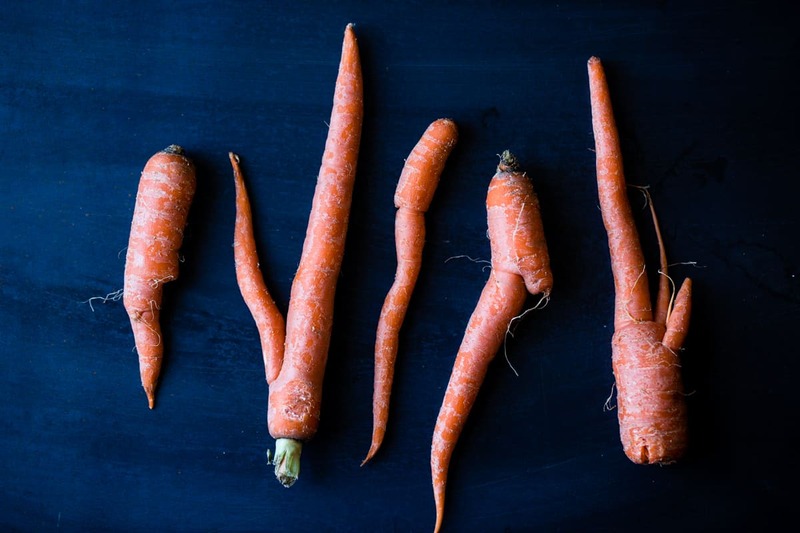 Imperfect produce to the rescue! I was expecting my Imperfect box to contain hideous freaks of vegetable nature, and was surprised (and even a little disappointed) that the specimen looked similar to those sold at any co-op or farmer’s market. 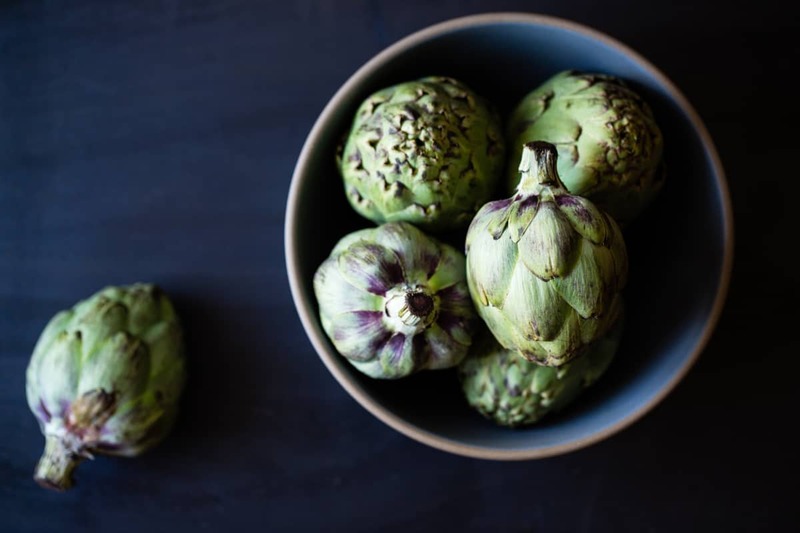 A bag of gorgeous purple-green artichokes cooked up meltingly tender and sweet (“too small,” Aleks said). 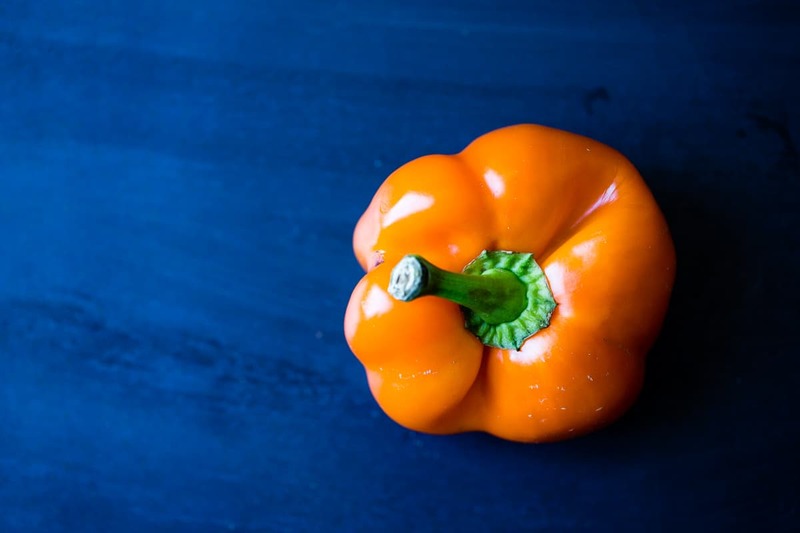 A squat yellow bell pepper was one of the most flavorful I’ve ever tasted (“too short”). Grapefruits the size of pomelos were perfectly juicy (“too big”). 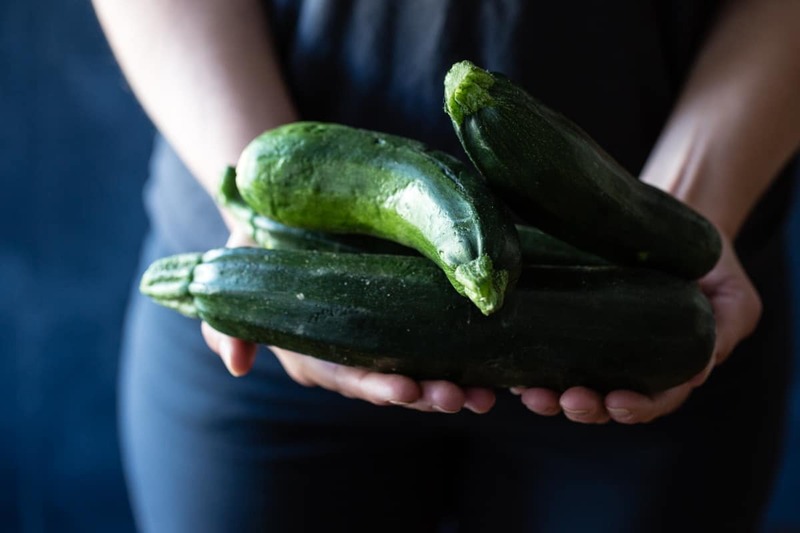 Plump, green zucchini cooked into a silky soup kissed with leeks and basil (“too fat”). 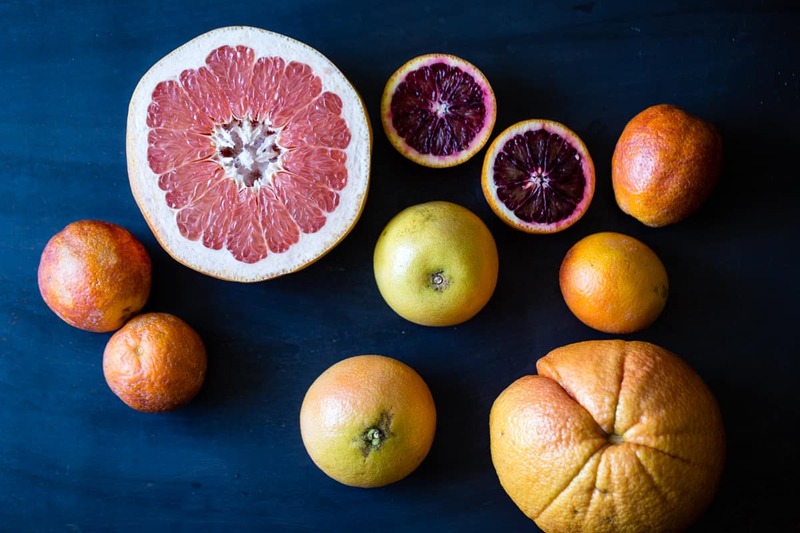 Blood oranges, beets, and apricots had no discernible flaws (*shrug*). I don’t think our Imperfect box could have found a better home – no one hates wasting food more than Jay, who has been known to scrape mold off of old cheese, fry up chard stems with onions and garlic, and fold tender radish greens into omelettes (they’re delicious!). In the spirit of vegetable salvation, I decided to use the nutritious beet greens in a pesto to serve with the tart. Beet greens are closely related to chard, and nearly as tasty, though they are primarily grown for their roots. 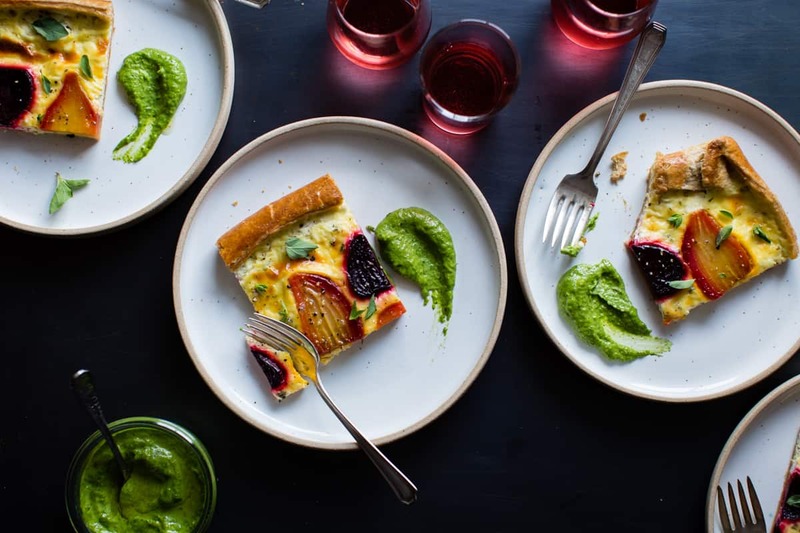 When blanched and pureed with olive oil, parm, nuts, and garlic, they make a creamy, mild pesto that works as well on this tart as it does on toast or tossed with gnocchi. Greens from red beets will turn out a brown sauce, so I recommend using the pure green leaves from yellow beets, lest you end up with imperfect (though still delicious) pesto. 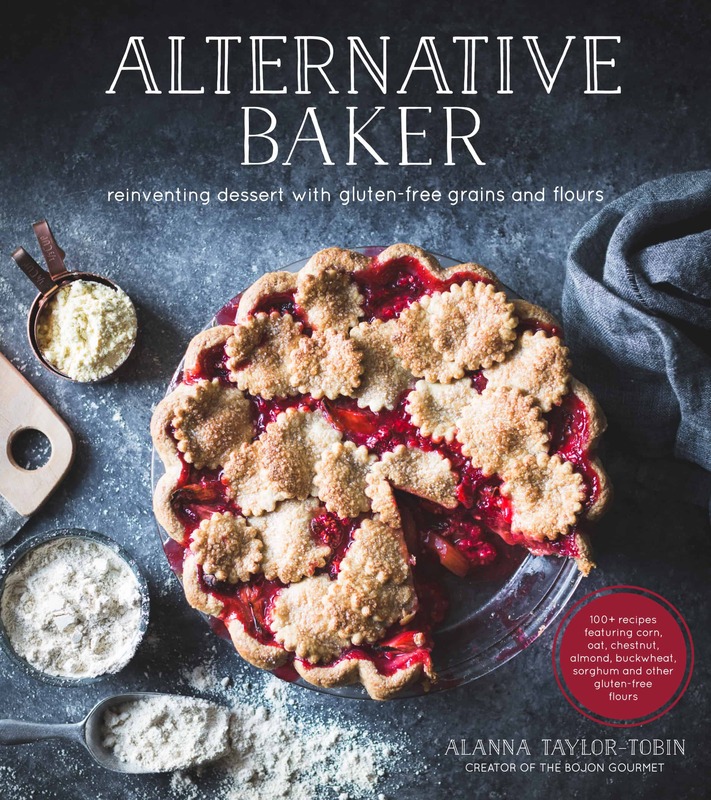 As for the tart, I employed a favorite treatment for my gluten-free, whole-grain, all-butter pie dough: roll it out into a large rectangle, slather it with goodies, and fold the edges over. 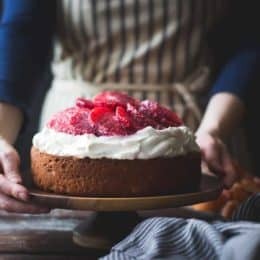 The filling is a simple mixture of whole-milk ricotta and goat cheese, egg, and fresh oregano which bakes into a tender foil for thick slabs of roasted baby beets. The crust turns bronzed and crisp, just the thing to slice into wedges, smear with pesto, and serve with a glass of cool rosé. Beets are extra sweet during the spring, though they stay in season pretty much year round in California. That said, I can imagine this tart with roasted zucchini, tomatoes, or eggplant traded in for the beets. If you’re in the San Francisco Bay Area and want to score some Imperfect produce of your own, you can have boxes delivered right to your home or office. 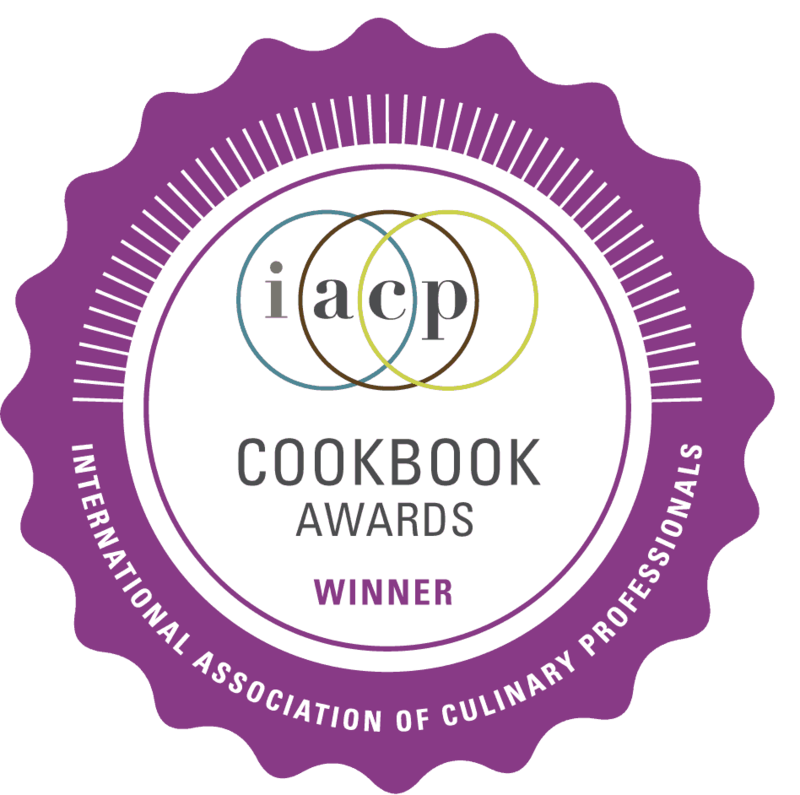 And best of all, Imperfect is offering Bojon Gourmet readers 50% off their first box with the code BOJONGOURMET. If you give this tart a go, I want to see! Take a photo and tag me on Instagram @The_Bojon_Gourmet and #BojonGourmet. 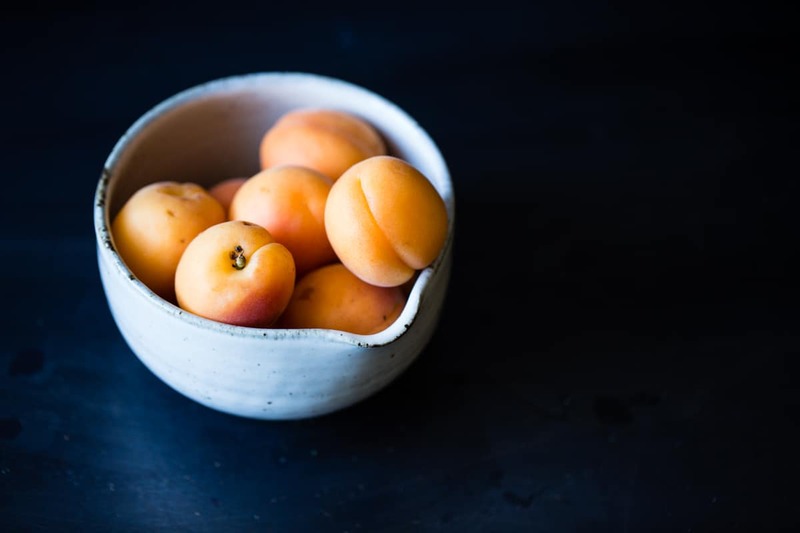 Many thanks to Imperfect Produce for the beautiful produce, and Mariella Luz for the hand made ceramic plates, pictured in this post. 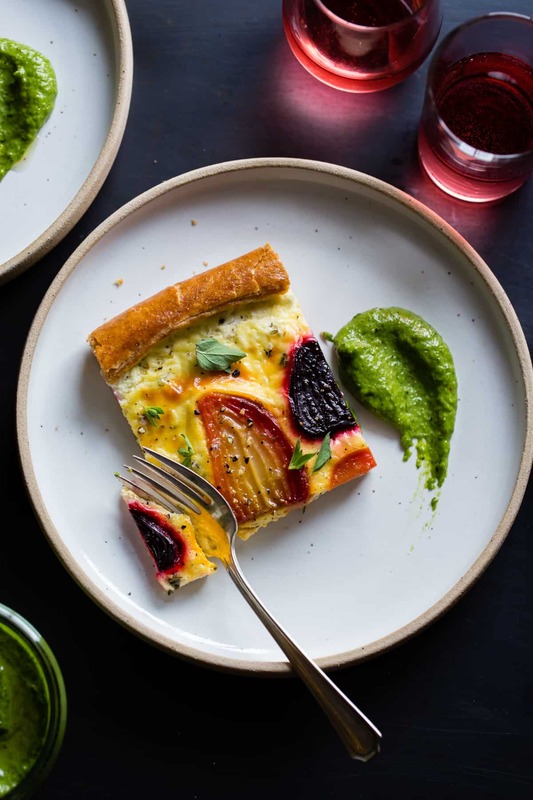 Make the crust, pesto, and roast the beets the day before, and this savory tart comes together quickly. If gluten isn't an issue, try a half recipe of this flaky wheat dough instead. If your beets are green-less, feel free to substitute arugula or basil in the pesto. Trim the beets and place them in a smallish baking dish with a lid. 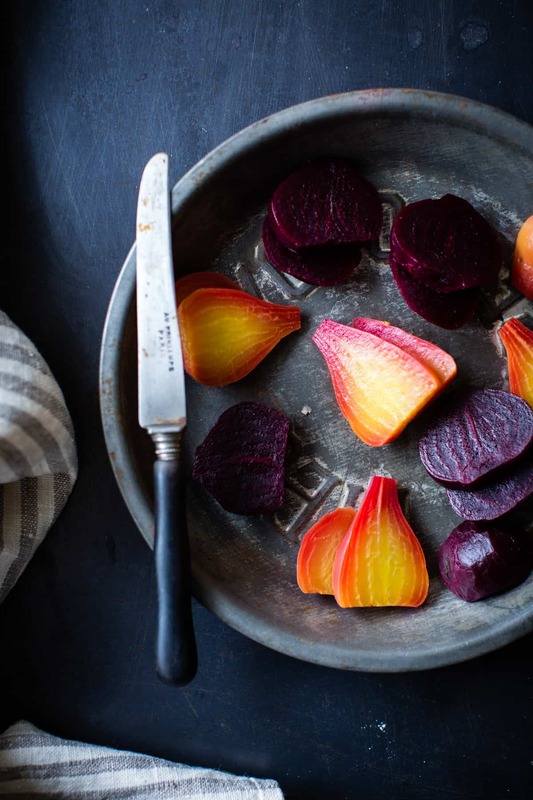 Add ¼ inch of water to the pan, cover, and roast in the oven until the beets are tender when pierced with the tip of a paring knife, 45-60 minutes. 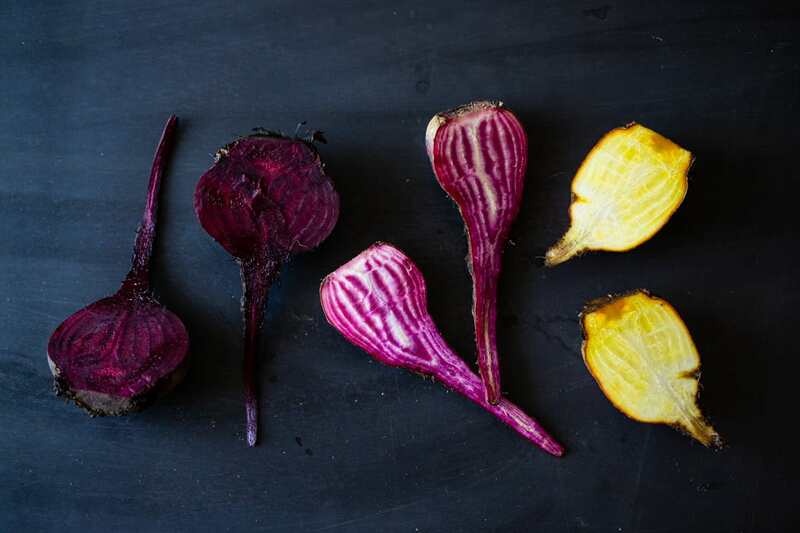 Remove and let cool, then peel the beets and slice each lengthwise into 4 pieces, each slice about ¼- to ½ - inch thick. 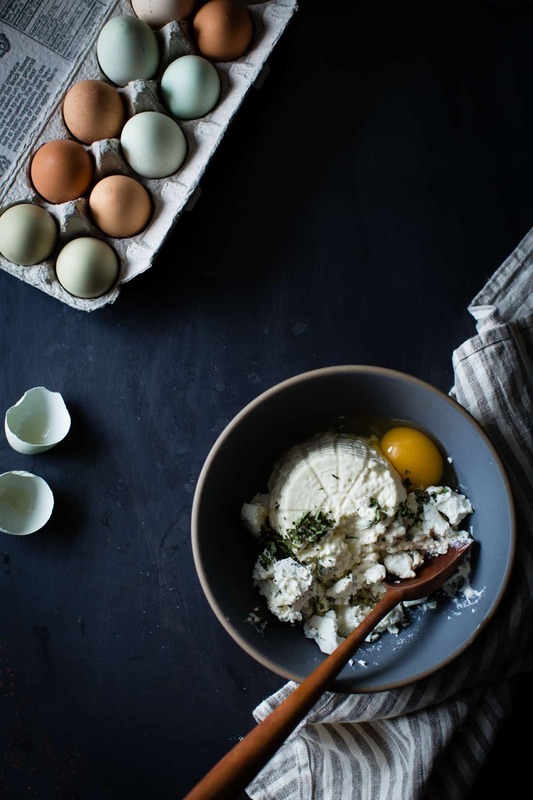 To make the filling, combine the ricotta, chèvre, egg, oregano, salt, and pepper together in a medium bowl and stir until mostly smooth (some chèvre lumps are fine). Chill until needed. Slide the dough onto a (preferably rimless) sheet pan, still on the parchment. Spread the cheese mixture evenly over the dough, leaving a 1″ border all the way around. Gently fold over the edges to make a crust. Nestle the beet slices evenly into the filling, and brush the crust with the beaten egg. Bake the tart at 400ºF until the crust and cheese are golden, 30-40 minutes. Bring a medium pot of water to a boil. Prepare an ice water bath in a medium bowl. When the water boils, add the beet greens and cook until bright green, 1 minute. Immediately drain and place in the ice bath until chilled. Drain the greens again, squeeze out as much water as possible, and chop roughly. 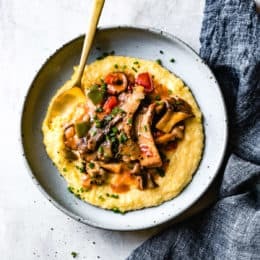 Place the blanched, shocked, and chopped greens in a small blender or food processor with the walnuts, garlic, olive oil, and parmesan and puree smooth. Taste, adding salt if needed. Drizzle the finished tart with olive oil, sprinkle with salt and pepper, and top with fresh oregano leaves. Cut the tart into 12 squares. Serve tart squares with a dollop of pesto. The tart is best when freshly baked, but extras reheat well in a hot oven in 5-10 minutes. The pesto keeps well, refrigerated airtight, for up to 1 week. We will be starting deliveries in Mountain View this summer, so stay tuned! This is just gorgeous! 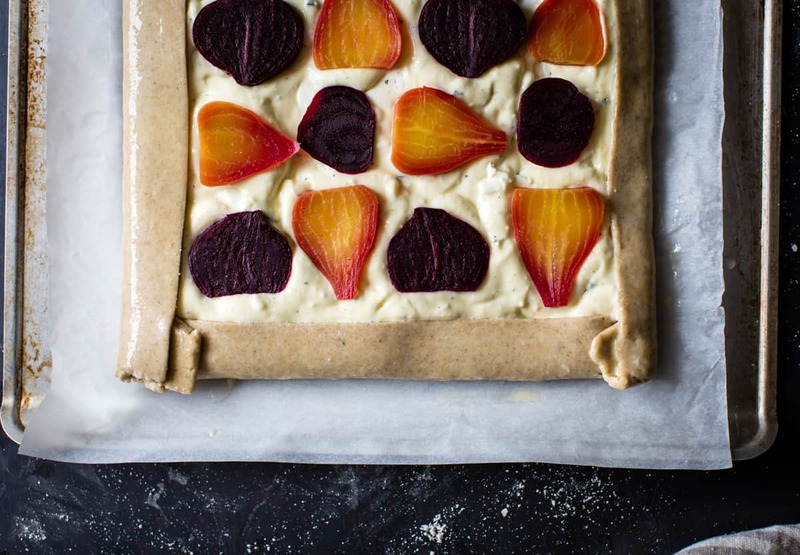 The colours of the beetroot and then the finished tart is amazing. The pesto is really inventive as well – I just love this. So beautiful!! Have you ever tried salt roasting beets? If not, I highly suggest it!! What a great way to use these veggies. This post was hilarious. I love how you embrace the imperfection of nature and all the things you gain from that. What a great idea. I too enjoy beet greens and stems. So great that you’re highlighting using the whole thing! It was only recently that I learned that produce considered “imperfect” was discarded and it seems so crazy to me! So I really, really love the concept of the imperfect veggie CSA. 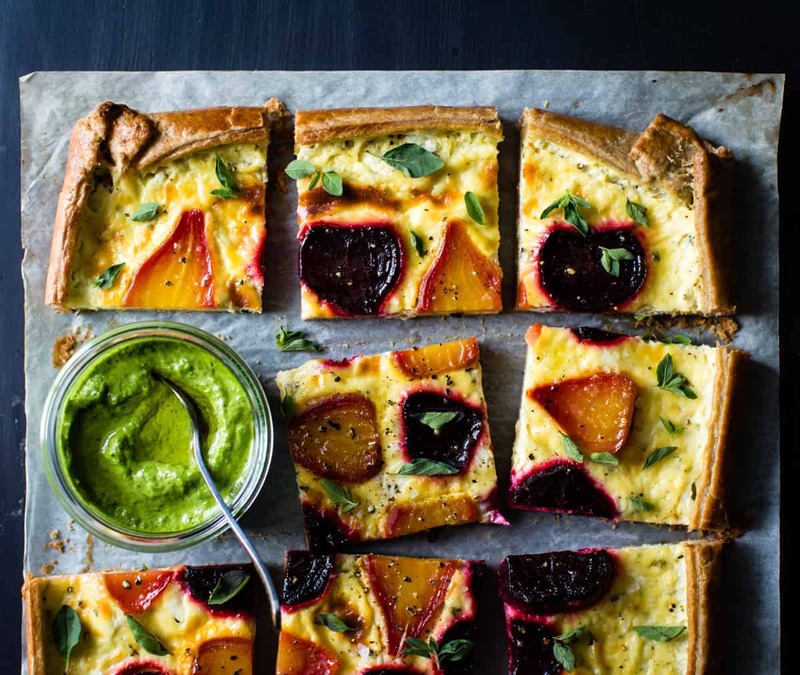 Those veggies you received still look pretty wonderful to me :) I love beets, and your tart (with that perfect pastry and creamy pesto!!!) look delicious. I keep meaning to try the fraisage technique! 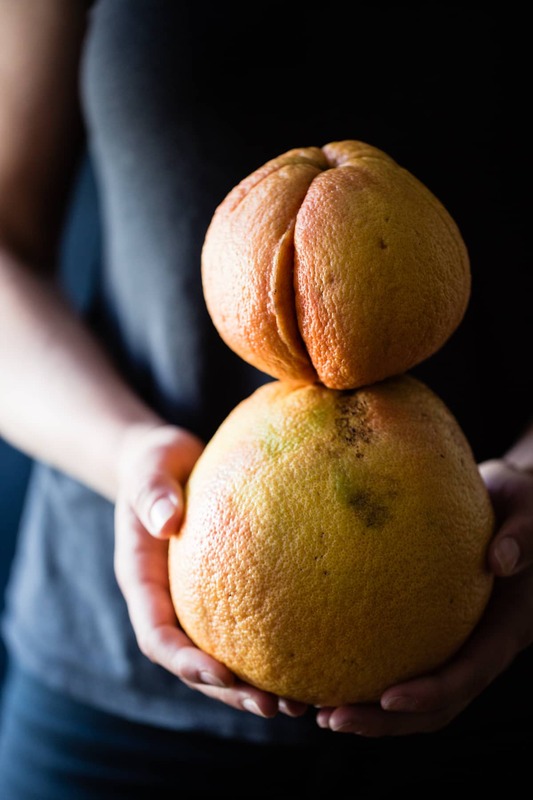 This looks heavenly and your gorgeous photos of ‘imperfect’ produce show their true beauty. 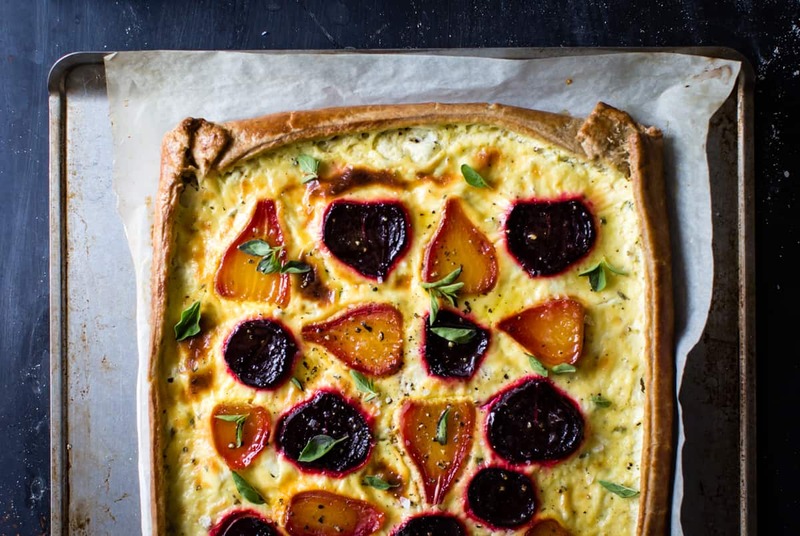 By the way, I love this tart, it’s so pretty and I’m a beets fan so would love to try it! Always a beet lover. Beautiful! Absolutely beautiful and what a great idea! This is one of the most delicious things I’ve eaten in a long time. 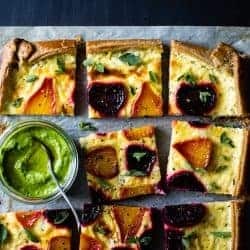 The crust just flaked apart – so buttery, almost like puff pastry – and the beets paired with all of that creamy cheese. It was savory and rich and sweet and earthy all at once. OBSESSED. Beet greens are so under rated! I’m so glad someone is putting them to use! BEAUTIFUL! 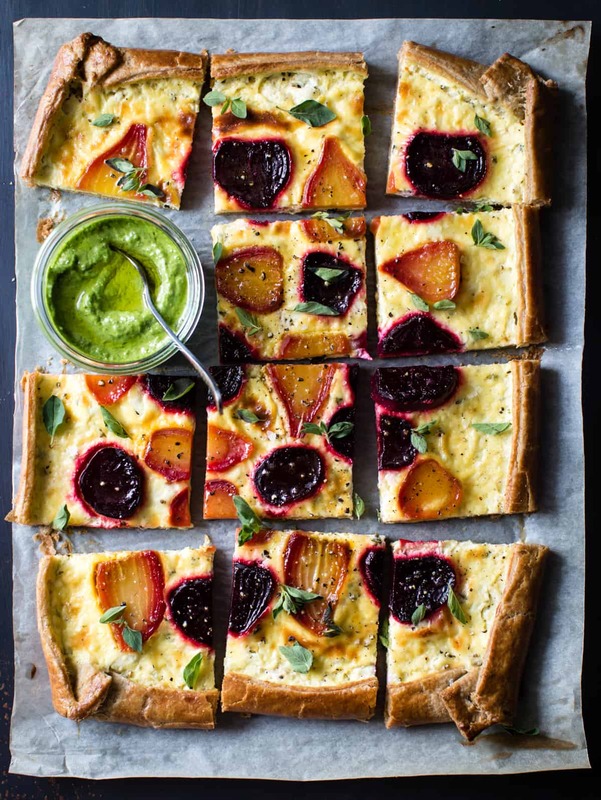 What a gorgeous use of the entire beet! I’ve sauteed beet greens before, and tossed them with warm pasta, but I’ve never made a pesto. Great idea! Total beet lover here. Lover of this tart also – gorgeousness!!! I made this using puff pastry as a short cut. The filling has the perfect consistency and the colors are STUNNING. I will definitely make this again! This is probably a safe bet, just take care not to burn it if you heat it in a toaster! This tart was delicious. I’m in love with the beet green pesto, so tasty and felt great to waste less food! 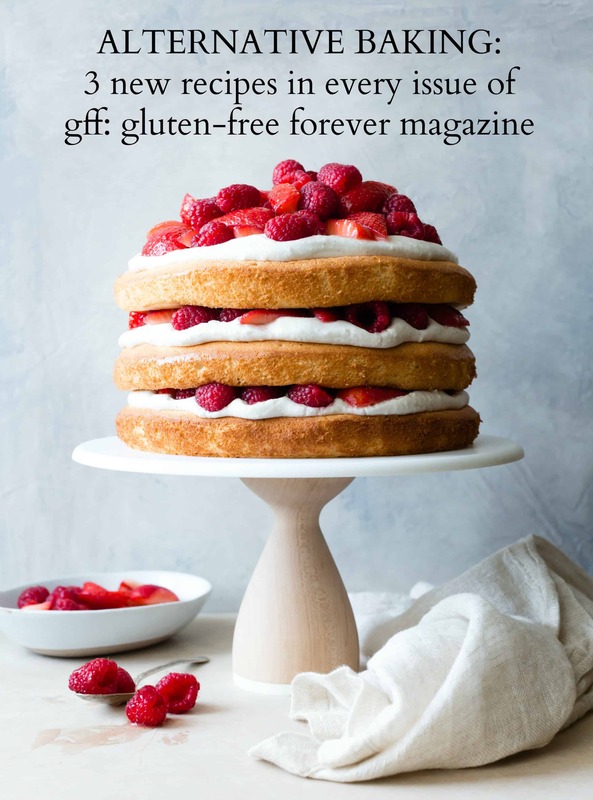 I used the original (gluten-filled) crust and it was perfect, so glad I made a double batch! 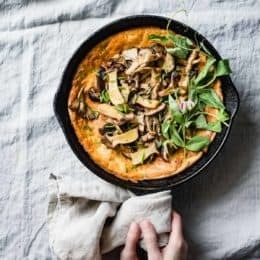 This is one of the best recipe to impress your guests with a tiny effort! I made it twice and every time the tart was gone in a minute. I used the pie dough from the store, and used feta instead of chèvre as one of my guest was allergic to chèvre. Still good! And I love the beets cooked this way; and I love how they look on ricotta! Beautiful and delicious!